How Does a Transit Claim Against the City Differ from a Claim Against a Private Company? | Merkel & Cocke, P.A. Home/Bus Accident/How Does a Transit Claim Against the City Differ from a Claim Against a Private Company? Many accidents happen on roads maintained by the State of Mississippi, the Department of Transportation, by local counties, and other governmental agencies. When a car, truck, bus, and other crashes occur, the natural instinct is to file a personal injury claim against the driver who caused the accident and the vehicle owners. When truck accidents happen, the trucking company that hired the truck driver may be liable. Private bus companies may be negligent as discussed in our recent blog post involving a private Teague VIP Express tour bus which crashed in Tunica, Mississippi. In some cases, the owner of the vehicle is a governmental agency. Many bus and train lines, such as MS Connect, are run by a company that is affiliated with or owned by the government. Students, seniors, people with disabilities, and many workers rely on public transportation to get to school, work, community centers, grocery stores, and other locations. The bus driver may be distracted by passengers, a radio, or by using a cellphone or GPS system. The driver may not be following the traffic laws. He/she may be speeding, driving through stop signs, or passing improperly. Passengers may not be discharged at the proper spots. The bus or other vehicle may not have been properly inspected. Repairs may not have been made properly. The driver may be driving too fast for conditions. Roadway conditions may make it hard for the driver of a large bus to navigate. The driver may be drowsy. The right to file a claim. Some governmental agencies may claim that the doctrine of governmental immunity applies. The Mississippi Tort Claims Act provides that injured victims can file an accident claim though some exceptions may apply. 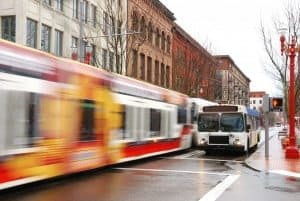 Normally, the city, state, or other owner of the transit system will investigate the case and inform the victim’s lawyer their view on liability and damages. If an agreement can’t be reached, then the accident victim, if no immunity issues apply, should have the right of file a formal accident complaint – within the statute of limitations period. The liability standards. Generally, public transit companies are subject to common carrier laws which place a high duty on the people who run the transit company, such as a public bus, because accidents can affect multiple people. Bus drivers, train operators, and other public vehicle companies have a duty to be extra careful because so many lives are at stake. Merkel & Cocke, P.A. have the experienced and resources to help you get justice. We aggressively fight to help governmental agencies liable for the accidents their drivers cause. To schedule a consultation in Jackson, Clarksdale or Oxford, call us at 662-799-1633 or complete our contact form.